Everything—no matter how innocuous or dated—had its use. It was a mantra he lived by. Born in 1946 to an Irish immigrant father and an American mother of French-Canadian descent, his parents’ coming of age was marked by the Great Depression plus decades of war. Unsurprisingly, this meant that his parents, Pat and Stella, were more than practical when it came to purchases and investments. They were intentional. They were frugal. It was “waste not, want not.” And they never threw anything away—a way of life that he held on to long into adulthood. But one day, Pat and Stella’s hoarding and his resulting belief that everything was useful, changed my life. After one of his routine check-ins with Pat and Stella, Dad arrived home with what looked like a small, hardcover suitcase. It was a shiny steel blue. He swung the case onto the kitchen table and called me over. He unlatched the cover and pushed it back to reveal the contents. My eyes widened. He smiled. We hugged. And I ran my fingers over the black keys of the old typewriter as I pondered which story I would write first … This is a piece of my story. And everyone has a story to tell; a glimpse to provide—including your B2B brand. Contently co-founder and recognized journalist Shane Snow is widely known in marketing circles for his knack for storytelling and his dedication to helping other marketers harness their storytelling skillset. A couple of years ago, I had the privilege of seeing Shane speak on this very topic at MarketingProfs B2B Forum. At that time, he laid out a three-step framework for telling better stories and it resonated with me. The concepts outlined in his framework should feel really familiar—they’re meant to, from my perspective. (Familiarity is a hallmark of good storytelling.) The switch is defining how you show and tell stories your buyers will care about, rather than simply creating more content. For a more in-depth look, check out Shane’s storytelling course that outlines the science of great stories, the elements of effective storytelling, and much more. The nostalgic tale I opened with is more than a fond memory. It’s a glimpse into who I am, where I came from, and how I got here. It’s my truth. It’s my context. It’s a piece of my story. Every brand has the opportunity to find, show, and tell their own stories. Stories about who they are, what they stand for, and how they solve problems. Stories that bring truth and add context. Stories that resonate and inspire. So, dust off your brand’s old hand-me-down typewriter and get to work. It’s storytime. Senior Director of Digital Strategy Ashley Zeckman and Content Strategist Annie Leuman are on the ground at Social Media Marketing World in San Diego from March 20-22, 2019. And as always, you can count on us to deliver you first-hand learnings and stories from the conference floor. Follow @azeckman, @annieleuman, and @toprank on Twitter to get live updates. 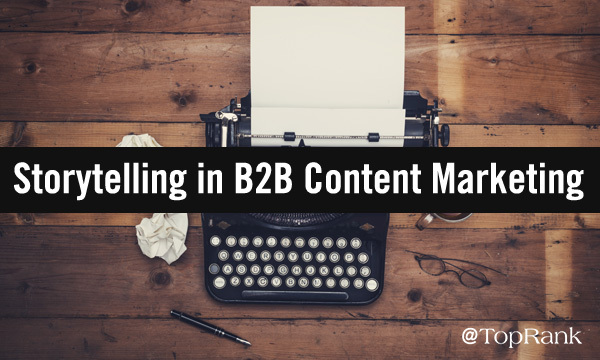 The post Once Upon a Time: Storytelling in Today’s B2B Content Marketing Landscape appeared first on Online Marketing Blog – TopRank®.